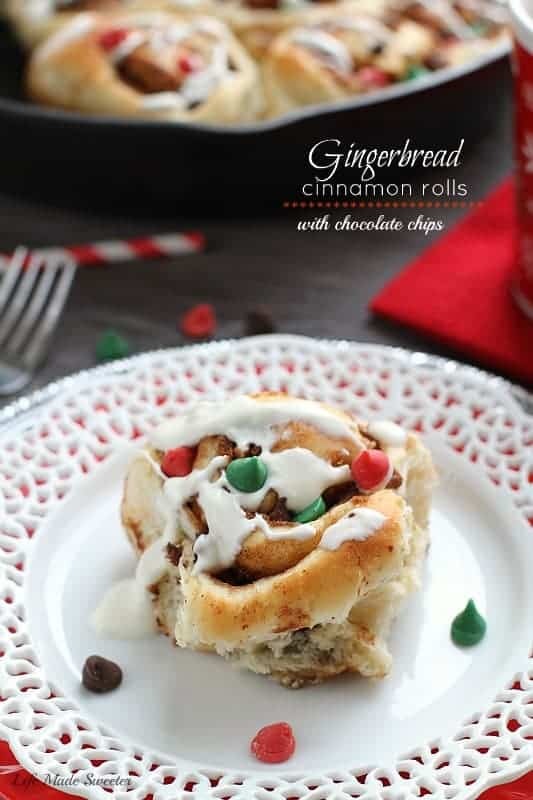 Delicious and easy gingerbread spiced cinnamon rolls with a gingersnap cookie and chocolate chip filling drizzled with cream cheese frosting. Makes an extra special and festive breakfast for the holidays! When is it too early to start bringing out the Christmas tree? I know most people think it’s way too early but for the hubs, he starts thinking about it even before Halloween. Every year I politely tell him to wait until at least November — so guess what we have sitting at the end of our living room now??? Yep, you guessed it! 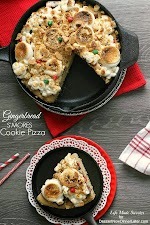 Okay, so I figured since we have our tree out, you won’t mind that I’m sharing my first Christmas recipe with you because it’s my most favorite time of the year. 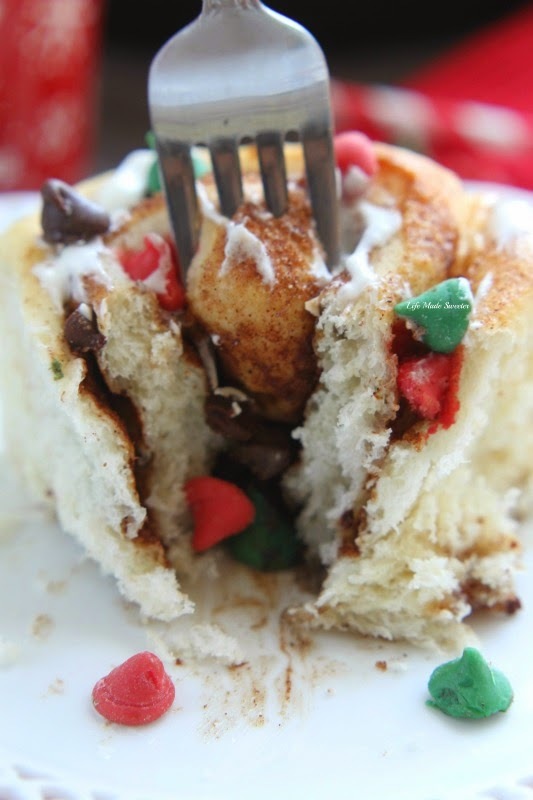 I’m starting the holiday season with these Gingerbread Cinnamon Rolls. 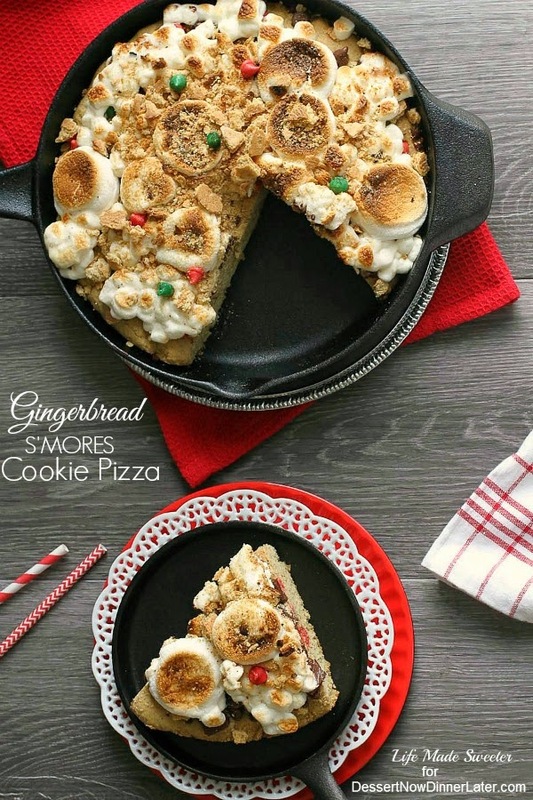 Because when we think of Christmas, we automatically think of all things gingerbread and peppermint. This is one of my favorite cinnamon roll dough recipes because it’s easy and has a quicker rising time which makes it perfect for beginners. You can choose to let the dough rise longer, but it’s nice to know that you can pop them into the oven within 60 minutes. 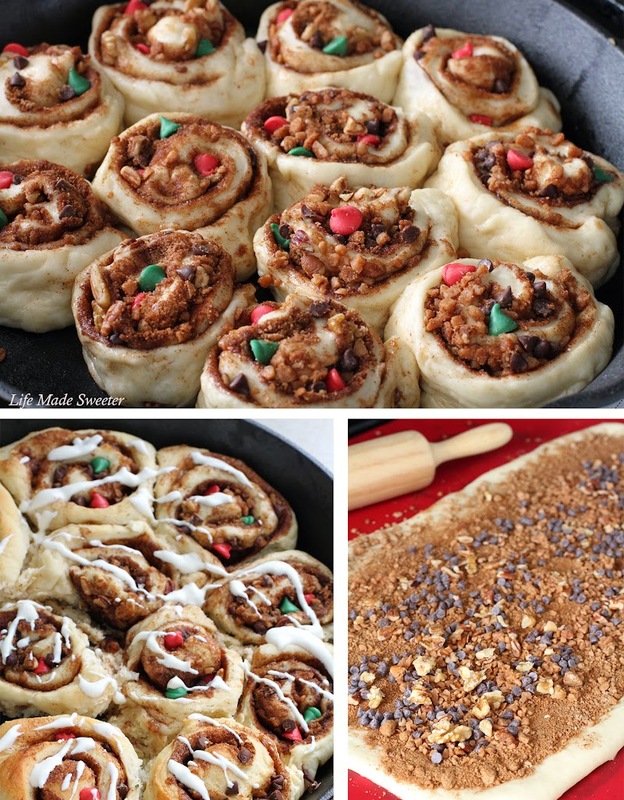 The dough and filling are packed with gingerbread spices and to kick up that gingerbread cookie flavor, I added crushed ginger snap cookies along with some chocolate chips to the filling. Gingerbread and chocolate make a great combination and when you top it off with a delicious cream cheese frosting – it will be impossible not to fall in love at first bite! 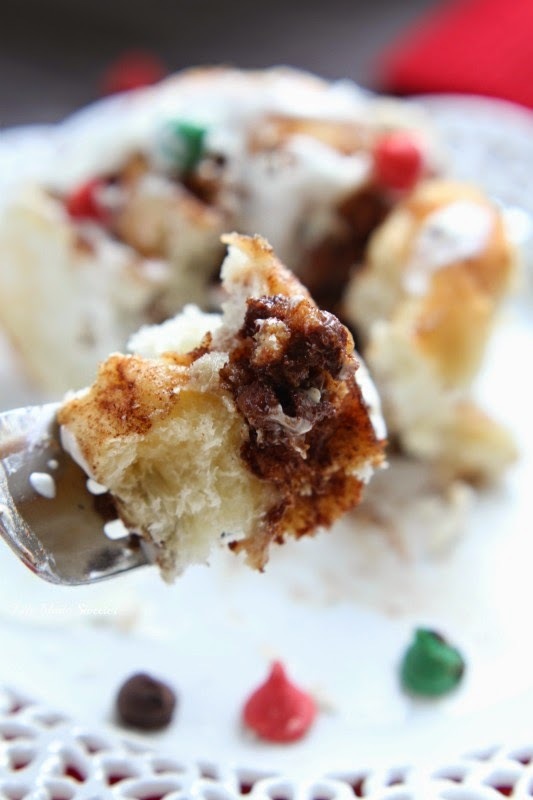 Warm gooey cinnamon rolls that are full of holiday flavors – these are sure to make any breakfast table merry and bright! Spray a 9" round pan or cast iron skillet with cooking spray. Set aside. Add the milk and butter to a small saucepan over medium low heat . Stir until the butter has melted and remove from heat. Let stand until luke warm temperature. In the bowl of your stand mixer, whisk together 2 cups flour, yeast, sugar, salt, cinnamon, ginger, cloves and nutmeg. Place in stand mixer using the dough hook attachment. Add the egg and water and mix until just starting to combine. Slowly add in the milk mixture and the rest of the flour (1 and 1/4 cups) until the dough starts to form and become smooth. Loosely cover the bowl with a damp towel and allow the dough to rest in a warm draft free place for 30 to 60 minutes allowing the dough to rise. 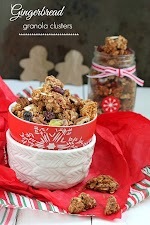 In a small bowl, whisk together butter, molasses, brown sugar, cinnamon, ginger, cloves, nutmeg until it forms a paste. After the dough is risen, roll it out on a lightly floured surface or a silicone baking mat into a rectangle about 14” by 9” and about 1/4 - 1/2 inch thick. Spread the gingerbread filling as evenly as possible over the rectangle getting as close to the edges as possible. Sprinkle chocolate chips evenly over filling. Starting on the long side, roll dough up snugly and gently to opposite end. Pinch the end seam to seal and cut dough into approximately equal portions or about 1.5 - 2 inches wide. (I use a piece of non-flavored floss to cut the pieces evenly). When ready to bake, preheat oven to 350 degrees.and bake for 25-30 minutes, or until they are golden brown. *If the rolls have been in the refrigerator, remove and leave out on room temperature about an hour before you plan to bake them to warm up. Beat together the cream cheese, butter, and powdered sugar until smooth. Add the milk or cream and vanilla and mix until combined. Pour over warm cinnamon rolls. *Dough can be made the night before and place in the refrigerator overnight covered with plastic wrap. Just remove from the fridge and leave out on room temperature about an hour before you plan to bake them to warm up.